When we first moved into this house, it was billed as a three bedroom. It is not. That was a lie. It is, more accurately, a two bedroom with a "bonus room" or (perhaps most accurately of all) a two bedroom with a large storage space that happens to have a window. We were only into the second year of our marriage when we bought the house. We were still a year away from becoming parents. Our previous living arrangements, which we'd been sharing for the past six years, had included at various times roommates, single bedroom apartments with kitchens too tiny to fit us both, and living rooms used for sleeping. The house seemed infinite. "It can be an office," we said. He still had a year left of law school, and I was embarking on the very beginning of my PhD program. Writing, reading, books. These were our habits and our tools. A space dedicated to the craft seemed like a dream. We put a desk in it. Then we put boxes in it. The basement of the century-old house proved inadequate for the safekeeping of anything that might mold or dampen. Off-season clothes, crates of old syllabi, these took over the tiny space that we'd envisioned would be our "office." They grew, as boxes do, until the room became not just a glorified closet, but one we could envision as nothing else. Then came the baby. Clothes that were too big, clothes that were too small, toys that were too loud, board books that could be cycled in and out of rotation. These joined the boxes. The room became so packed that we could only just open the door and precariously perch something new atop the stack. Sure, we cleaned it. There were annual purges and piles of donations, but somehow the room inhaled deeply and sucked most of the stuff back to where it had been. You could no longer even see the desk. We wrote at the kitchen table. We set a card table in front of the couch in the middle of the night. We transformed communal spaces into private ones for brief intervals. He graduated. I graduated. We got by. "We'll move," we said. We'll get a place with a real office. We'll have bookshelves lining the walls and a desk for each of us. It will be beautiful. Soon there will be another baby. The room called to us again, but this time with more urgency. We unpacked it all. We Marie-Kondo'ed the books and took down the sagging bookshelves with their busted walls. We dismantled the desk. We consolidated the boxes and crammed them into corners elsewhere. We filled the room with toys. With games. With a space where my older daughter can escape the tyranny of a newborn. And now there is a trampoline in my living room. There is a plastic playhouse in my dining room that takes up as much room as the table. There is a bin of toys in the front hallway. There are stuffed animals in my bed and plastic boats in my bathtub. 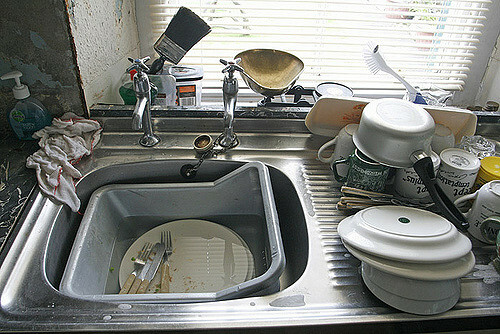 The only room that has avoided an invasion, the only space in my entire house I can enter as my own, is the kitchen. And it strikes me as quite funny. After all, the kitchen is the symbol of oppression. It's where the women stand, barefoot and pregnant (as I was earlier this evening), trapped in their domesticity, chained to the demands of gender roles. And I don't even like baking. It does not calm me or please me. And while cooking can be gratifying, most days it is another chore, another to-do to cross off a list a mile long. And no writing gets done between those walls, and it is not, it is most definitely not, the room of my own that I thought I would have by now, by 30, by career, by doctorate, by now. But it is mine. And there is something calming about saying "no toys in the kitchen" and meaning it. There is something peaceful about stacking the dishes in the cabinets and being able to close them. About clearing off the counter and seeing it shine. About putting on a podcast and sweeping the floor. About existing in a space for a moment that feels centered, roughly organized, gently guarded. I can hear my 22-year-old self scoffing. I can see her roll her eyes and call me a sell out, but she doesn't understand the compromises that led to claiming this space or just how many things can go a little off the list of plans or just how fast those little changes add up to a different set of rules entirely. And maybe in eight more years, my 30-year-old self will be the one who couldn't see what it would all be like. Maybe I will sit down in my private, well-stocked, brightly-lit upstairs office and laugh about the time I thought lighting a candle while listening to neo-soul as I did the dishes was the pinnacle of claiming my space. But maybe not. And I think it will be okay.